"The customer walks into a shopping center and activates his/her WiFi browser (free, branded, downloadable app) to see which stores offers what e.g. trials, demo's, vouchers, special offers; right now!" - our partner Clicode presents SpotEx. Btw, they (Clicode) offers a lot of QR-code based solutions too. Some of them are also based on components from our QR-code suite. Interesting event in Amsterdam and interesting definition for Smart City applications. It looks like our SpotEx is a perfect fit for Smart City applications. Free WiFi for check-in. Looks like this, is not it? Lets you search for places, show them on the map, copy locations to mobile, check-in anywhere as well as prepare mobile web pages for customized check-ins. Our JSOS collection is growing again. Random Image servlet lets you display random images in your Java web applications. Yet another our mashup has been updated - Location from Twitter. Usually, the bundle Twitter + Maps always means mapping twits and show them on the map. Yes, we have such mashups too (see for example, Photo map или Local twitter). But here everything is vice versa. It is just a reverse task. "In this article, I’m going to put together four remote-control systems that you can use to control various entertainment and display systems throughout your home, from a single, central computer. This is especially useful for those of you that have a "main" computer in your living room or living area that everyone uses." - very practical solutions for remote monitoring. A good introduction: Euclidean Distance, similarity, Pearson Correlation Coefficient - see it here. Interesting by the way what they can do with iOS that prohibits Wi-Fi scanning. Indoor positioning at this moment is a hot area for LBS applications. There is no common denominator for indoor location but technically Wi-Fi based solutions are probably prevailing. Wi-Fi based approach for indoor positioning is always based on the net of basic nodes (Wi-Fi tags for example) with known locations. Based on that we can deploy some triangulation for getting position for our Wi-Fi device. Actually, it is similar to cell-id, where Wi-Fi tags play the role of base stations. So, the main problem is the need for some preliminary preparation steps for Wi-Fi network we are going to use for indoor positioning. And what if we need some dynamic solutions? It is actually a starting point for our SpotEx (Spot expert) project. What if we will take from traditional indoor positioning systems the first step only – Wi-Fi networks detection? Obviously, if our mobile phone can see some Wi-Fi access point we are somewhere nearby. And the word “nearby” actually dictates that we should use proximity services rather than traditional location based services. That is probably fine because the proximity (being nearby) let us directly provide the relevant content to our users, without the preliminary geo-calculations. But we need some tools that let us add measurement to the word “nearby”. Similar to the geo-location tools we need services for proximity based operations. Our SpotEx model presents one of possible tools for the proximity services. And as the second step in our “new indoor approach” we will add the ability describe some content that depends on the Wi-Fi networks visibility. We will get some kind of context aware браузер – our user will see content depends on the exiting Wi-Fi access points. Actually, we can add rules for the visibility where we can use Wi-Fi, time, probability, history of access etc. We do not need in this case any preliminary preparation for that network. We can proceed even dynamically added nodes. For example, Wi-Fi access point we can associate our rules with could be Wi-Fi access point opened by demand right on another mobile phone. Once again – it is not about access to some Wi-Fi network. Access point could be protected and closed for public access. The only thing Spot Expert is based on is its visibility. Access point plays a role of sensor (trigger) here. If our mobile user can see that network he/she is nearby. Current implementation provides Android application for end users and web client (including mobile web) for creating rules and setting content nodes. See Spot expert site for details and application downloading. There is also a special simplified version prepared for retail area – In Mall Notes. Contact us for demo access. A side effect - WiFi chat. This service provides the predefined elements of content: web chat and discussion groups connected to some visible Wi-Fi access point. Suppose we have some Wi-Fi network in train (bus etc.) WiFi chat application provides communication tools for people in the net’s area. You can get more details in our article about WiFi chat. And here is our new idea - Wi-Fi Chat. Forum and chat linked to some Wi-Fi network. 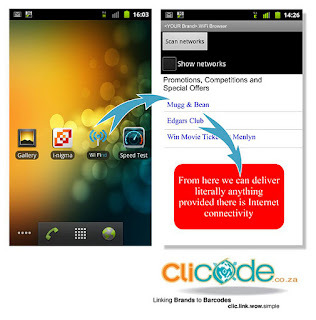 It is a mobile application that lets you see available (visible) Wi-Fi networks and link (attach) discussions and chats to them. We are not talking about connecting to Wi-Fi networks. We are using any Wi-Fi network just as a sensor. If you can see it from your mobile, you are somewhere near. We can call it Wi-Fi proximity. That is an idea. All people seeing the same network are in the some proximity. So, they could have some common points for the discussions. "Facebook’s ambitious plan to weave together the actions we take across the web and engineer a social network replete with frictionless sharing is finally ready to be deployed, VentureBeat has learned. The remaining pieces of Facebook’s new Open Graph are in the final stages of testing and are nearing release" - from here. Coldbeans Software announced the next milestone in JSOS (servlets office suite) development. JSOS reaches the version 7.60. Lets you search for places, show them on the map, copy locations to mobile, check-in anywhere as well as prepare mobile web pages for customized check-ins. For customized check-in place owner (or advertising/marketing agency, for example) can define all the aspects of check-in - data to be posted on user's wall, data to be returned as a confirmation, Google Analytics code for stats monitoring etc. And here is our new idea - WiFiChat. Forum and chat linked to some WiFi network. It is a mobile application that lets you see available (visible) Wi-Fi networks and link (attach) discussions and chats to them. We are not talking about connecting to WiFi networks. We are using any WiFi network just as a sensor. If you can see it from your mobile, you are somewhere near. We can call it WiFi proximity. That is an idea. All people seeing the same network are in the some proximity. So, they could have some common points for the discussions.